Rather than synthesizing metal oxides through chemical processes as fillers in polymer composites, metal oxides from natural sources (waste) could provide a cheaper and environmentally friendly alternative. In this work, a fine powder prepared from properly cleaned periwinkle shells was examined for its use as filler for polymer composites for high-voltage application. The powder was characterized using scanning electron microscopy (SEM), X-ray fluorescence spectrometry, Fourier transform infrared spectroscopy, thermal conductivity set-up and a programmable LCR Bridge. The SEM image of the powder revealed a range of particle sizes that vary from 2 to 34 μm. The chemical analysis shows that CaO is the dominant metal oxide in the powder with 81.8 wt%. The dielectric constant and the electrical conductivity of the powder are 11.08 and 1.5876 × 10−8 S m−1, respectively, at the frequency of 200 Hz. The electrical conductivity of the powder is lower than the conductivity of pure CaO, while the thermal conductivity is slightly higher than that of pure CaO. This could be due to the influence of the other constituent metal oxides. The is an indication that periwinkle shell powder if properly processed to micro- and even nano-sized particles can be a good candidate as a filler in polymer composites to produce polymeric insulation with good insulating and thermal conducting properties. Metal oxide micro- and nanoparticles are important materials due to their applications in several areas such as catalysis, sensors, optoelectronic materials and environmental remediation . In a quest for polymeric insulation with improved dielectric and electrical properties, metal oxide particles in micro- and nano-sized were also found to have played a vital role. Polymer nanocomposites were found to have improved the dieletric loss and breakdown strength at certain filler content. Some of the common metal oxides used to modify the structure of the polymer matrix include SiO2, TiO2 and Al3O2 [2, 3]. While the microparticles of these metal oxides produced materials with increased dielectric loss, the nanoparticles were found to produce polymer composites with decreasing dielectric loss at lower filler loading. This was attributed to the morphology of the nano-materials . Calcium oxide as an alkaline earth metal oxide is known to have many applications. This includes its use as catalyst , toxic-waste remediation agent, an additive in refractory [5, 6], a crucial factor for CO2 capture [7, 8, 9], flue gas desulphurization and pollutant emission control . It has also been used as an additive to modify the electrical and dielectric properties of materials . In a study to improve the mechanical, thermal and processability properties of recycled polyethylene terephthalate/polyethylene mixture (70 wt/30 wt%), CaO nanoparticles were added to the mixture. The thermal stability was reported to be pronounced with the addition of CaO, the hardness of the mixtures increased progressively with the increase in CaO . 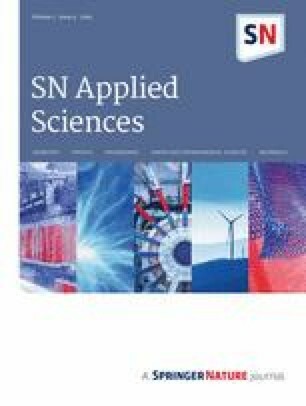 In another work to study the effect of CaO nanoparticles on the properties of polyamide 6, it was reported that there was a notable improvement in the thermal stability of the nanocomposites compared with neat polyamide 6. . CaO nanoparticles are often produced via thermal treatment of Ca(OH)2 [11, 14] or CaCO3 [7, 15] as precursors. They have also been prepared by calcination of Ca(OH)2 which was synthesized by adding NaOH . A report on the electrical properties of calcium oxide shows that the metal oxide has an electrical conductivity of 1 × 10−6 S m−1 [16, 17]. The electrical conductivity of polyaniline (PANI) nanofibers was studied by systematically varying the addition of CaO in the range from 0.005 to 1.00 g. The obtained result shows that the highest conductivity value of 6.329 S cm−1 was obtained by the addition of the lowest amount of CaO (0.005 g). Increase in CaO loadings was reported to have resulted in a decrease in the electrical conductivity of the composite material . Aside from clay, other micro- and nanoparticles are synthesized using several methods, and the controlled production of metal oxide nanoparticles is important for its effective and successful application [11, 19, 20]. Animal shells are known to be composed of several metal oxides that are being exploited for numerous industrial applications. Instead of producing micro- or nanoparticle through chemical methods, can the micro- or nanoparticles produced from such waste sea animal shells serve the same purpose? The report of the characterization of natural pearl of Pinctada fucata from Gulf of Mannar using scanning electron microscope (SEM), and energy dispersive studies (EDS) revealed that natural pearl contained Ca and O in the form of calcium oxide and Nb was present. They suggested that this may be the reason for the formation of lustrous layer in the shell . Cockleshell was reported to consist of a higher percentage of calcium carbonate. Kamba et al. attempted to synthesize calcium carbonate nanocrystal from cockleshell powder using high-pressure homogenizer. The synthesized CaCO3 was reported to be composed of the aragonite form of calcium carbonate. Tamasan et al. attempted to produce hydroxyapatite and/or tricalcium phosphate (TCP) from Sputnik sea urchin shells—Phyllacanthus imperialis and from a type of sea snail shell called Trochidae Infundibulum concavus . The FTIR analysis revealed the presence of carbonate groups of CaCO3 identified from the peaks in the region of 1400–1600 cm−1 of the spectra. The materials formed after the chemical reaction with H3PO4 were reported to be promising materials for bone fillers . Periwinkle is another type of seashell animal. It is a species of small edible sea snail that is consumed in large quantity in Nigeria. Its consumption produces residual shells which posed an environmental hazard. The shell is a natural ceramics which contained several metal oxides used in material applications such as a filler in concrete production. The shell ash was investigated as a replacement for cement in concrete. In this work, microparticles prepared from waste periwinkle shells are characterized for its possible use in polymer composite for high-voltage electrical insulation application. Periwinkle shells are shown in Fig. 1a, obtained from the local market in Zaria, Nigeria, which were properly washed with water and followed by acetone. The washed shells were dried in an oven for 24 h. The cleaned periwinkle shells were passed through a turning operation in a crusher and ball milling machine to produce the powder. The crushed particles were sieved using a sieve of 75 μm mesh size to produce the powder shown in Fig. 1b. A pellet of diameter 40 mm and thickness 2 mm was prepared from the periwinkle shell powder. Cellulosic resin was added to the powder as a binder and was then carefully mixed. The mixture was pressed into a pellet using a hydraulic press by applying four tonnes load for 120 s. The microstructure of the samples was studied using Phenom ProX Desktop scanning electron microscope (SEM) equipped with an energy dispersive spectroscopy system. The samples were held on the sample holder using a double-sided carbon tape before putting them inside the sample chamber, and SEM was operated at an accelerating voltage of 15 kV, and the image was recorded. Agilent Cary 630 FTIR machine was used to identify the chemical constituents in the compound from the characteristic frequencies on the spectra. And the elemental composition of the powder was determined using Oxford X-Supreme 8000 X-ray fluorescence (XRF) spectrometer. The powder obtained from the periwinkle shells was loaded in the sample chamber of the spectrometer at an accelerating voltage of 30 V and current of 10 mA to produce the X-rays to excite the sample for 10 min. The fluorescent X-rays emitted by the material sample are directed into a solid-state detector which produced a continuous distribution of pulses, the voltages of which are proportional to the incoming photon energies, and the diffraction grating used is usually a single crystal, the angle of incidence and take-off on the crystal, a single X-ray wavelength was selected. The counter is a chamber containing a gas that is ionized by X-ray photons and the signal is amplified, transformed into an accumulating digital count. The system is controlled by a PC running the dedicated Mini Pal analytical software. The thermal conductivity of the pelletized powder was determined using Searle’s method. The set-up was initially used to determine the thermal conductivity of materials with known thermal conductivity. The pelletized sample was placed in the sample chamber and heated at one end by the means of an electrical power supply. Water was made to flow through the apparatus and it entered the tube at the end of the steam chamber and leaves at the end nearer to it. The power supply was switched on when the water was flowing, and the input current and voltage were recorded. The water starts to get hotter until a constant temperature difference is reached, and the water flow was adjusted so that the temperature difference is about 5 °C. Thermometers θ1 and θ2 placed where water was coming in and out were used to measure the temperatures of the outlet and inlet water. The temperatures θ1 and θ2 were recorded. The experiment was repeated three times to determine the average value of the thermal conductivity of the sample. The pelletized powder was placed in a two-electrode test cell in a temperature-controlled chamber for dielectric measurement. 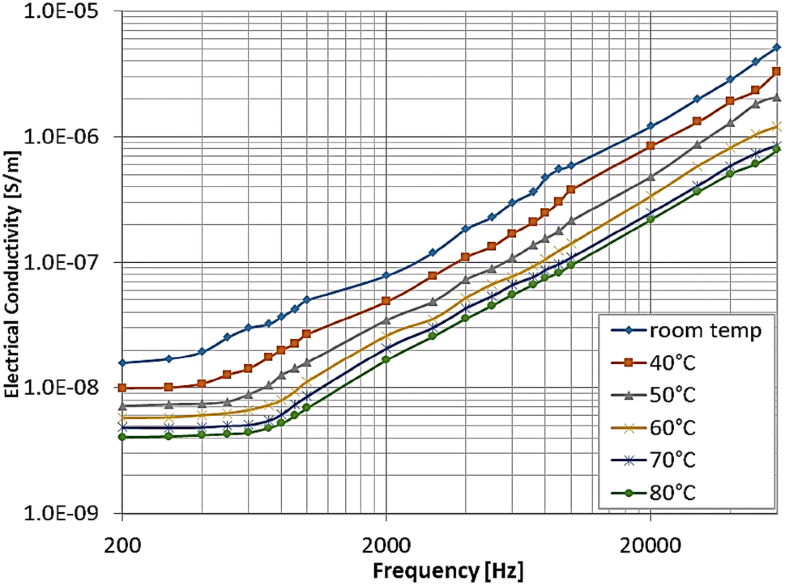 The terminals of the test cell were connected to Rohde and Schwarz HM8118 Programmable LCR Bridge with frequencies range of 20 Hz to 200 kHz as shown in Fig. 2. It has a measurement accuracy of 0.05%. The set-up was used to measure the capacitance, loss tangent and the resistance of the sample at a temperature from 25 to 80 °C. 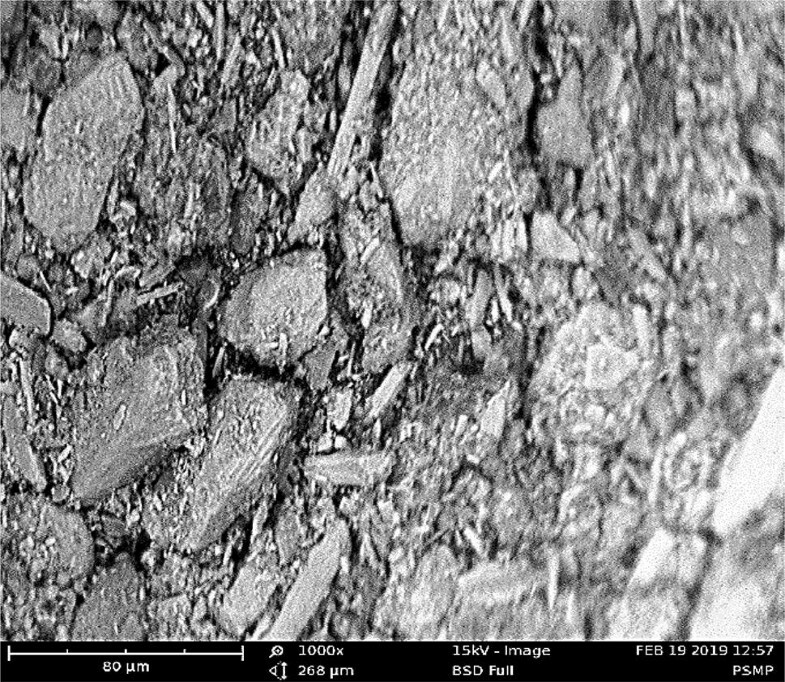 Figure 3 shows the scanning electron microscopy (SEM) image of the periwinkle shell powder particles. The image revealed a surface of random-sized particles. The particles’ average sizes were determined from the micrograph. The periwinkle shell powder was found to have particle sizes that range from 2 to 34 μm. Figure 4 shows the FTIR spectra of the periwinkle shell powder. The weak band at 1785.4 cm−1 corresponds to C=O bonds from carbonate. There appeared two well-defined infrared peaks at 1468.6 and 857.3 cm−1 which are attributed to the characteristic C–O stretching and bending modes of calcium carbonate, respectively. The sharp peak at 711.9 cm−1 which appeared at the fingerprint region is related to Ca–O bonds. The observed band at 1080.9 cm−1 is assigned to the symmetric stretching of CO32− ions. The peak is an indication that the shell composed of the aragonite form of calcium carbonate. The peak at 1785.4 cm−1 is among the common characteristic features of the carbonate ions in calcium carbonate. The 1036.2 cm−1 may be related to the presence of Si–O bonds [21, 22, 24]. Figure 5 shows the XRF spectra of periwinkle shell powder. 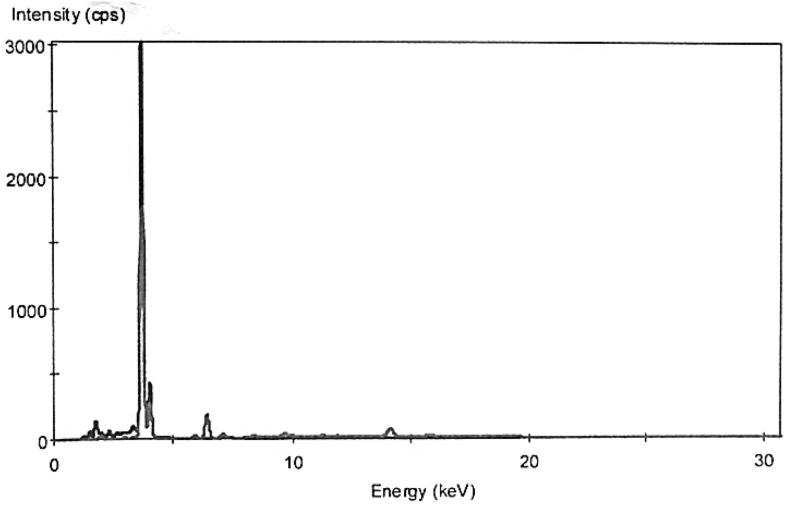 There appeared two peaks (3.71 and 4.02 keV) on the spectra that are assigned to calcium. The 3.71 keV peak has the highest intensity, an indication that calcium is the dominant metal in the sample. Other visible peaks are at 1.71 keV assigned for silicon, 1.22 keV for magnesium, 1.42 keV for aluminium, 6.41 keV for iron and 2.2 keV for sulphur . The determined chemical composition of the periwinkle shell powder from the spectra analysis as presented in Table 1 shows a high amount of calcium oxide. This is associated with the presence of calcium carbonate, the main component of the powder as revealed by the FTIR results. The shell contained traces of several oxides of metals such as sodium oxide (Na2O), phosphorous oxide (P2O5), titanium oxide (TiO2), chromium oxide (Cr2O3) and zinc oxide (ZnO) with calcium oxide (CaO) as the dominant metal oxide with a concentration of about 81.8%. The elemental analysis shows that CaO has the highest compositions in the periwinkle shell powder and it constitutes about 81.8% of the total elemental composition. SiO2, MgO, Al2O3, Fe2O3 and SO3 constitute about 15.732% of the elemental composition. CaO, SiO2, Fe2O3, Al2O3, TiO and MgO are among the hardest substances. Traces of P2O3, SrO, Mn2O3, K2O, Cl, Cr2O3 and ZnO were also found to be present. The elemental composition has similarity with XRF analysis of clay which has been used in polymer matrix composite but with 48.12% SiO2 and 34.54% Al2O3 . where V is voltage, I is the current flowing through the sample, A is the cross-sectional area of the sample, θ1 is the temperature of inlet water, θ2 is the temperature of outlet water and L is the thickness of the sample. 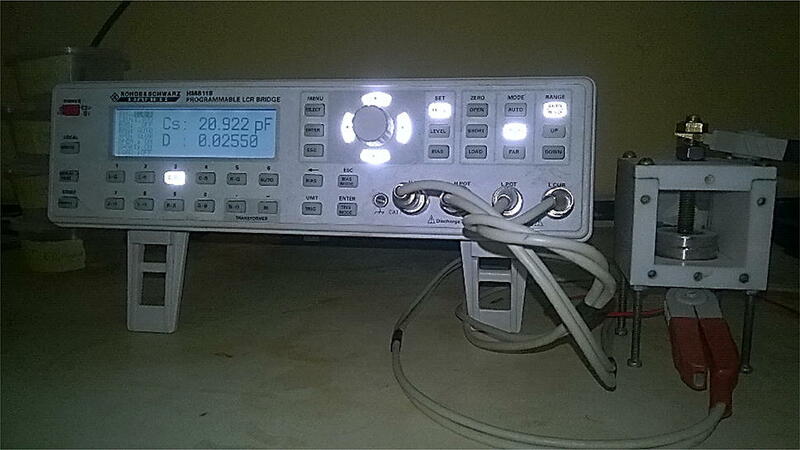 The experimental measurement was repeated three times, and the variables were recorded, and the thermal conductivity values were calculated to be 16.884553, 20.121950, 16.884553 Wm−1 k−1, respectively. 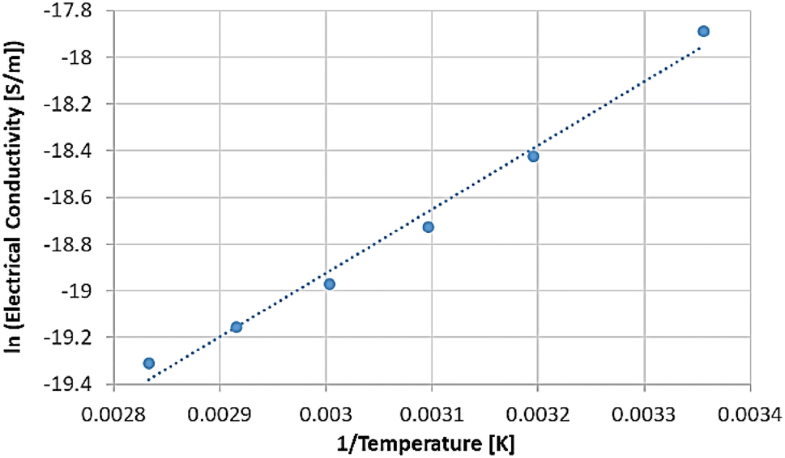 The average thermal conductivity, K of the sample, was calculated to be 17.963685 Wm−1 k−1. Materials of good thermal conductivity are used as electrical insulation as they perform a dual function of insulant and coolant. They are supposed to serve as a medium to transport the heat generated due to ohmic heating in the electrical system. Thermal conductivity values of some of metals oxides are as follows: CuO has a thermal conductivity between 20 and 30 Wm−1 k−1, SiO2 is 1.7 Wm−1 k−1, MgO is 35 Wm−1 k−1, Al2O3 is 35 Wm−1 k−1, TiO is 9.2 Wm−1 k−1 and CaO is 15 Wm−1 k−1 . Periwinkle shell pellet has a thermal conductivity of 18.0 Wm−1 k−1 which is close to the thermal conductivity of pure CaO with a thermal conductivity of 15 Wm−1 k−1. The difference may likely be due to the presence of high thermal conductive metal oxides in the powder. The thermal conductivity is higher than that of TiO2 and SiO2. 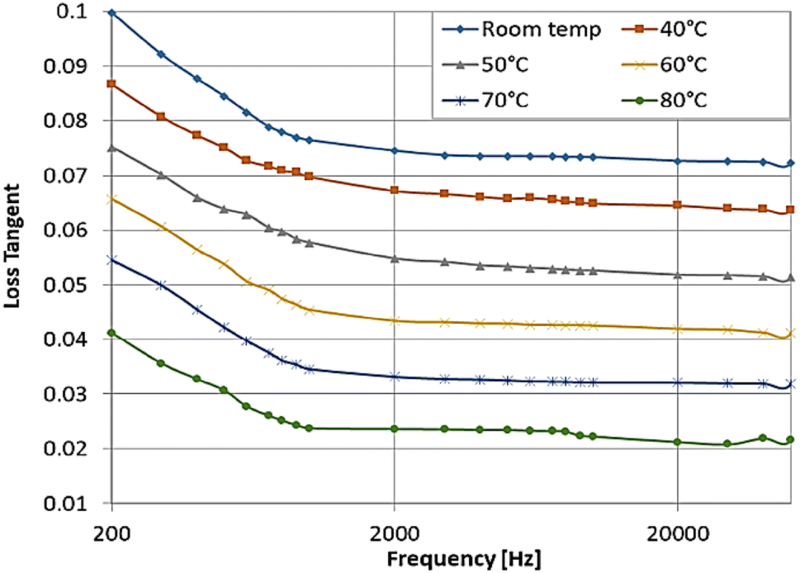 This is an indication that its dispersion in the polymer will produce a composite with better thermal conductive properties compared with the commonly used TiO2 and SiO2. The thermal conductivity of the sample is also slightly higher than that of pure CaO. This is an indication that the sample under study which contained 81.8% CaO is more thermally conducting compared with the pure CaO crystal. The dielectric measurements were taken within the frequency range of 200 Hz to 50 kHz. 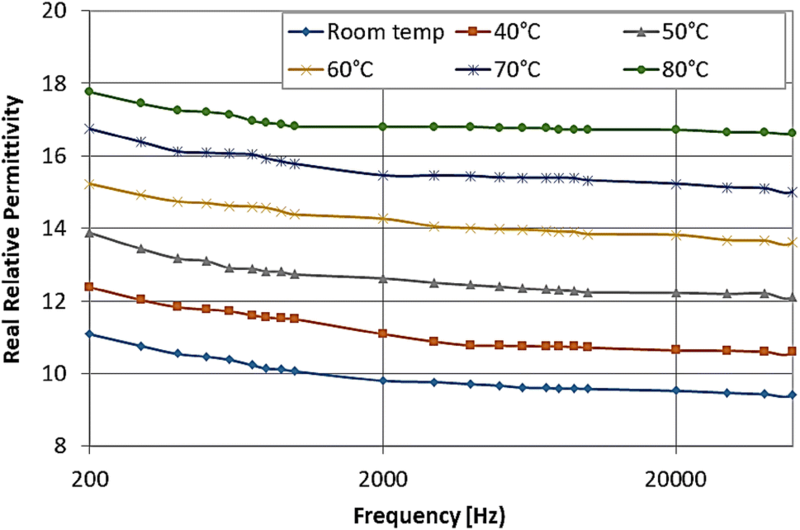 Figures 6 and 7 present the relative permittivity (dielectric constant) and loss tangent of the samples from an ambient temperature of 25–80 °C. The relative permittivity was relatively constant for all temperature between the frequency ranges of 50–2 kHz. Below 2 kHz, a slight increase was observed in the relative permittivity. At room temperature, the relative permittivity (also known as dielectric constant) has an average value of 9.5 at higher frequency window. This increased to 11 at a frequency of 200 Hz. This value is comparable to the value of 12.2 obtained for CaO at 300 K . Meanwhile, temperature increase led to an increase in the real part of the relative permittivity. The loss tangent (dielectric loss) was also observed to be relatively stable between 50 and 1 kHz, and an increase was observed in the permittivity below 1 kHz with a slope of about − 1. This is an indication of DC conduction mechanisms in the sample. Increase in temperature resulted in a decrease in the dielectric loss. The decrease in loss tangent with increasing frequency between 200 Hz and 1 kHz is an indication of pure DC conduction. The conductivity beyond 1 kHz is connected with AC conductivity which is a combination of DC conductivity and loss due to polarization. The DC conductivity is likely due to charge transport by electrons ‘hopping’ from donor to donor. It may also be due to negative oxygen ions migrating through the crystal. When temperature increases, the system entropy increases and that will attempt to randomize the dipoles, thereby counteracting the effect of the applied electric effect. This leads to the reduction in charge transport and polarization and a reduction in the dielectric loss of the sample. The constant part which is a DC conduction is attributed to charge transport, while the part with a slope is the AC conductivity which is attributed to both charge transport and loss due to polarization processes. The electrical conductivity decreases with an increase in temperature, and the turning point from DC to AC conductivity shifts towards higher frequency as temperature increases. This also showcases the influence of temperature on charge transport and polarization mechanism in the material. 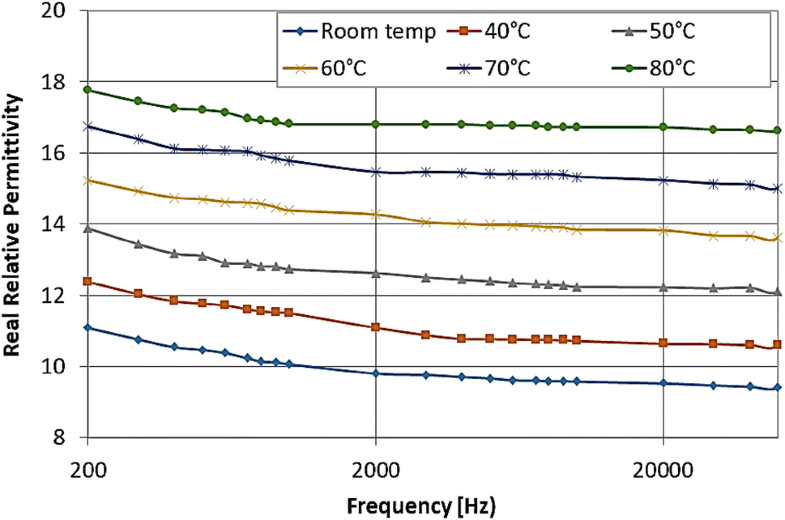 Temperature reduced the influence of polarization on the electrical conductivity of the sample thereby extending the frequency range of DC conductivity. where σ is electrical conductivity, kB is the Boltzmann constant, T is the temperature in Kelvin, Ea is the thermal activation energy with the same unit as kBT and A is pre-exponential constant. The plot shows that electrical conductivity fits into Arrhenius relation within the temperature range studied. The thermal activation energy was evaluated to be 0.236 eV. The thermal activation energy suggests the energy necessary for the electrons to ‘hop’ from one donor to another or the energy needed for negative oxygen ions to migrate through the crystal at low temperature. Metal oxide micro-composite powder was produced from the waste periwinkle shell. The micro-composite contained 81.8% CaO, 15.7% of the combination of MgO, Al2O3, SiO2, SO3, Fe2O3 and traces of some other metal oxides such as P2O5, P2O5, SO3, TiO2, Cr2O3, Mn2O3, SrO. The powder has a thermal conductivity of 18.0 Wm−1 k−1, a value slightly higher than the thermal conductivity of pure CaO. The difference may be attributed to the presence of higher thermal conductive components in the powder. The thermal conductivity is higher than that of TiO2 and SiO2 that are commonly used as filler in polymeric insulation. This suggests that a polymer composite with the powder may produce insulating materials with better thermal conductive properties in comparison with polymer composites with TiO2 and SiO2. The relative permittivity (dielectric constant) of the pelletized powder is within the range of metal oxide ceramics. It increases with an increase in temperature. The loss tangent decreases with temperature. There exist an AC conductivity which is a combination of DC conductivity and loss due to polarization. The DC conductivity is likely due to charge transport by electrons ‘hopping’ from donor to donor. It may also be due to negative oxygen ions migrating through the crystal. The electrical conductivity of the powder is lower than the conductivity of pure CaO. This suggests that periwinkle shell powder if properly processed to micro- and even nano-sized particles can be a good candidate as a filler in polymers to produce polymeric insulation with good insulating and thermal conducting properties. The application of periwinkle shell in composite insulation materials will give new use to the animal waste. The authors wish to acknowledge the contribution of Mr. Muhammad Dabai towards setting up the thermal conductivity measurement facility.